Activists outraged after Burundi jails schoolchildren for writing on president's photo - now they're responding with drawings of their own. While the crackdown continues in Burundi against anyone who dares challenge President Pierre Nkurunziza, authorities showed how thin-skinned they really are when arresting seven schoolchildren last week. The children stood accused of having scribbled on the president's photo in their school books. This is not the first-time school administrators and authorities have cracked down on children's doodling. 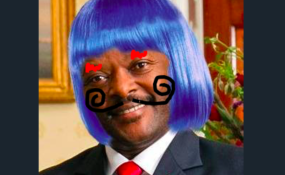 In 2016, Burundian intelligence agents arrested eight secondary school students and also accused them of insulting the head of state for drawing and writing phrases like "Get out" or "No to the 3rd term" on a picture of Nkurunziza in a textbook. The same year, hundreds of children were expelled from several schools for scribbling on the president's face in textbooks. With so many real crimes being committed in Burundi, it's tragic that children are the ones being prosecuted for harmless scribbles. Since April 2015, the country has been in the throes of a political and human rights crisis triggered by Nkurunziza's controversial decision to stand for a third term. Since then, security services and the Imbonerakure, the ruling party's youth league, have killed, arbitrarily arrested, abducted, beaten, raped, and intimidated real and perceived political opponents with impunity.